This week, we join with fellow members of the Association of American University Presses (AAUP) in celebrating the third annual University Press Week. This year’s theme, “Great Minds Don’t Think Alike,” celebrates the incredible range of contributions university presses from around the world make to stimulating ideas and conversations. Don’t miss the University Press Blog Tour, a virtual journey through the innovative contributions university presses make to scholarly communities, regional knowledge, and awareness of global issues. The UW Press blog will be participating in this tour on Thursday, November 13 and will feature contributions from other university presses on our Twitter feed. We encourage you to take a moment to browse through this Collaborative Projects Gallery that highlights the increasing importance of collaboration between presses, their home universities, and other local and national partners. On Wednesday, November 12, at 1 PM EST, AAUP will host a “Collaboration in Online Publishing” panel on Google+ moderated by Jennifer Howard from the Chronicle of Higher Education. Howard will be joined by three panelists who have spearheaded innovative collaborations that cross the boundaries of nations, institutions, and disciplines: Barbara Kline Pope, Executive Director for Communications at National Academies Press and also President of the AAUP, Peter Dougherty, Director of Princeton University Press, and Ron Chrisman, Director of the University of North Texas Press. When I think about the books that I regularly read and recommend, and those which I most eagerly anticipate, I’d have to say that those published by University of Washington Press are at the top of my list. Some of my recent favorites include Shaping Seattle Architecture, Seattle in Black and White, Native Seattle, Reading Seattle, Mary Randlett Portraits and Nisei Daughter (and so many other titles in the recently launched Classics of Asian American Literature series). Their books are of interest to casual readers, history buffs, city workers, scholars, and teachers. I can’t tell you how many times I’ve pulled out one of these books for someone who tells me, “I didn’t know about that!”—and they’re excited to know more. Often one of a kind titles, these books give our history an accessible, physical presence. These are well researched, beautiful books, lush with photographs, maps and other types of illustrations that anyone with even a casual interest in our region will want to own. I can’t tell you how many times over the years I’ve been asked by teachers, often just here on a tourist visit, if I know anything about the incarceration of Japanese Americans during World War II. These teachers wonder if it’s really true and if there are books that can help them teach their students about this history. I send people to Densho, of course, but I also send them home with books by Tetsu Kashima, or maybe a copy of Nisei Daughter. I’ve sold copies of America is in the Heart to people who say that they’ve never read a book written by a Filipino American. People researching Jim Crow in other areas are very surprised when I show them copies of Seattle in Black and White or Forging of a Black Community so they can learn about Jim Crow segregation in this area. And people are always coming in and asking about books about Seattle’s architecture and I’m very pleased to have an array of titles to recommend. Thank you to Michael, Geoff, Karen, and all the booksellers who work hard to promote our titles and help make it possible to publish these important books! In other university press news, the 2014 Book, Jacket, and Journal Show is now touring around to AAUP member presses and we’re thrilled that our in-house designers each have work featured in the show. Their work was selected from approximately 330 jacket and cover designs as some of the very best examples from a pool of excellent university press book design. 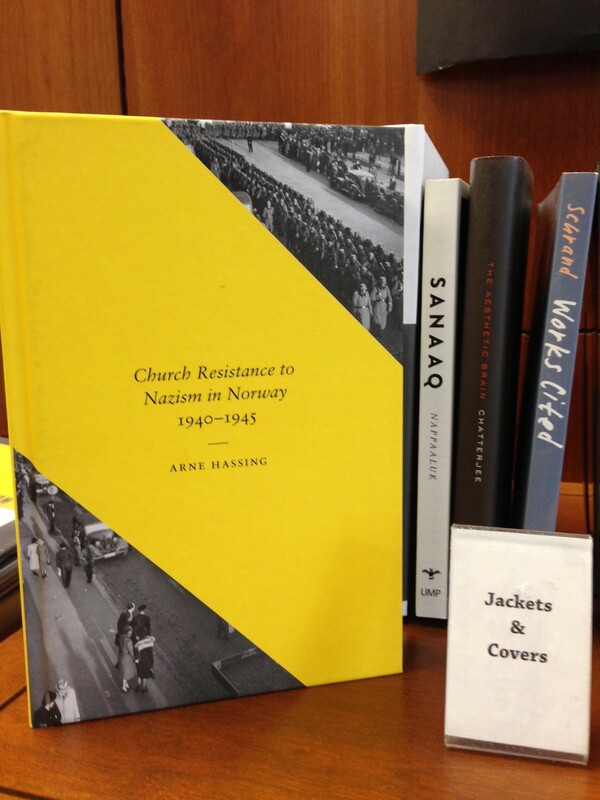 We include here the two featured jacket designs, along with statements from the designers and from juror Emmet Byrne. Design statement: Quiet typography combined with the loud, divisive yellow bar is meant to reflect Norway’s quiet yet steadfast opposition to Nazi occupation. Emmet Byrne, Design Director at Walker Art Center: This is a cover that takes the architecture of the book form into account and creates something that is beautiful to hold. The yellow bar speaks to resistance, to armbands worn in protest, censorship, and the division between church and state. It also visually parallels the street in the image, which creates a very dynamic layout. 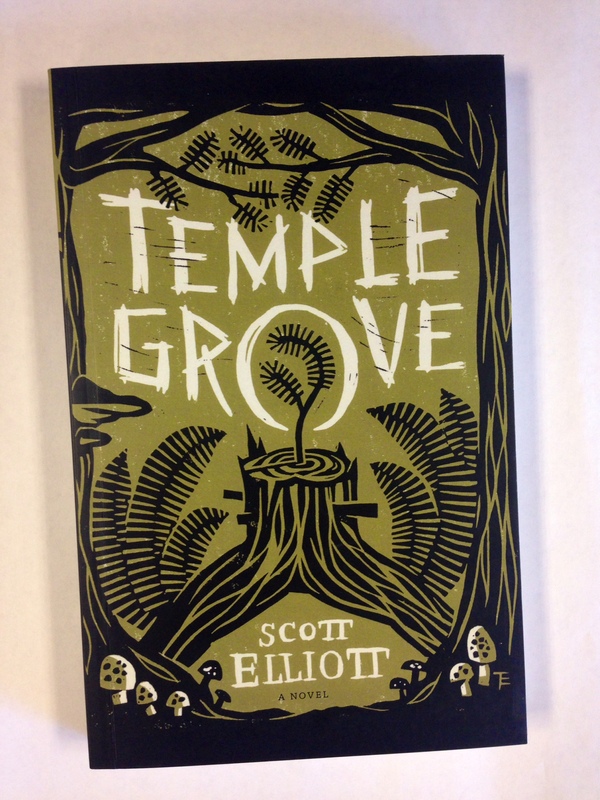 Design statement: A dynamic novel set in the forests of the Pacific Northwest. I was struck by the image of a nurse log (a young tree growing out of an older fallen tree) as a metaphor for the complex family dynamics captured in the story. The illustration is a two-color linoleum block print. Emmet Byrne: This cover had a really great Pacific Northwest vibe, and the cohesion between type and illustration was flawless. Besides that, the central motif of a young tree growing out of an older tree was a great way of talking about the cycle of life. The image works well on the spine. The cover really sets a great mood. Check back this Thursday for more from our talented design team! This entry was posted in Book Design on November 10, 2014 by uwpressblog.